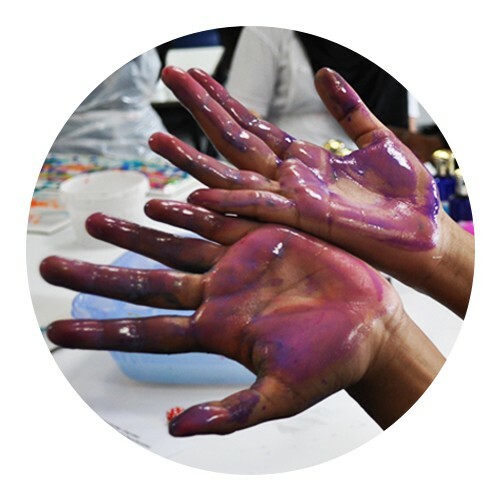 Based in Hackney, East London, we explore the world of art and design and create workshops for innovative and exciting happenings. Using traditional creative methods as well as a wealth of experimentation, we utilise the recyclable and throwaway materials so readily found in today’s society and through this we produce a plethora of amazing pieces. Working with all the community, we encourage messy encounters and happy accidents and find that some of our best works are created through chance. We create fantastic artworks that have been inspired by you. Children, families and adults embrace ARTBASH. ARTBASH club – after school club for children aged 5 – 11 years. Now running Thursday evenings 4 – 5.45 pm termly. ARTBASH camp – a whole week of arty fun delivered for children during the summer school holidays. ARTBASH Ed – working in schools and educational establishments delivering exciting workshops and creative projects. ARTBASH bash – a birthday bash or party for any occasion. No more kids running around madly in your house. ARTBASH more – more than just working with children, we offer workshops and create artworks with adults in the business / corporate sector as well as charitable trusts such as the NHS. We hope you enjoy looking through all the creative things we get up to. Please make contact and say hello to discuss a project in mind. You can also make a booking or join the waiting list for ARTBASH club or camp.